When Can My Child Use Booster Seat? 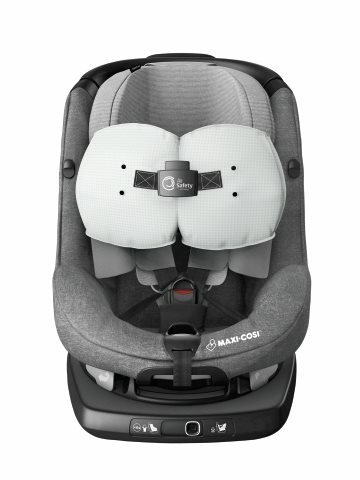 Maxi-Cosi AxissFix Air is a safe child seat with easy handling. It is the safest solution you can have while your baby travels in a forward-facing safety seat as its unseen protection, the invisible airbags in the straps kick in when it is most needed. Thus, they reduce the loads on the head and neck caused by a frontal crash and reduce the risk of serious injuries. The seat can swivel in 360° to offer the best ease of use by using a central dash board – it provides an easy switch between the rearward and forward facing position. Use the seat in a rearward-facing position up to two years / 87 cm, and after reaching this level, turn the seat in a forward-facing position to provide maximum safety (whichevers the child reaches first). The indicator for measuring height shows you when it is time to change position. The seat’s headrest and harness can be simultaneously adjusted. Belt hooks help the harnesses keep out of the way while you put in your child. I really like this option, for me it has always been a great help both with a small baby and a toddler – I can only recommend this feature. The harness adjuster can also be used with one hand. To provide maximum comfort for the baby, the headrest can be adjusted in seven positions and the seat reclines in four positions both way. Sitting and lying position are both possible. The Top Tether Isofix indicator ensures the highest safety. Safety belt installation option is not possible. According to Maxi-Cosi, the lifetime of the seat is ten years, for which you get a warranty. Its compact design makes it fit even into small cars. Maxi-Cosi AxissFix Air fits in most vehicles equipped with ISOFIX, and on all i-Size compatible vehicle seating positions. However, you can also find out if this seat fits into your car by clicking here. When the car seat is installed on the front passenger seat, you must switch off the front passenger airbag if your child is sitting in a rearward-facing position. I hope you liked this review and if you have any question about the Maxi-Cosi Axissfix Air seat or want to leave your own personal experience, leave a comment below.